Our award winning sushi bar utilizes only the highest quality & freshest fish to satisfy even the most serious sushi eaters. Over 70 choices of made-to-order sushi all served with a flare of artistry. Our rolls are wrapped & rolled with nori (seaweed) & served with wasabi (Japanese horseradish) & gari (pickled ginger). Signature Rolls - try our tasty creations like the Red Dragon Maki or the Hawaiian Style Roll. Inside-Out Rolls - try favorites like the California Roll, the Philadelphia Roll, or the Spicy Tuna Roll. Platters - check out our generous platters featuring helpings of tuna, snapper, salmon, & yellowtail. 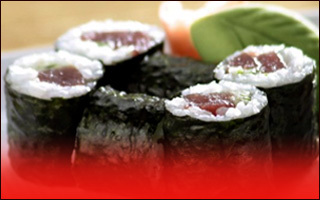 Hoso Maki - traditional favorites like yellowtail maki, salmon maki, & shrimp maki.